Why do I feel foolish today! Someone is gonna pay for this! F can stand for Furs, Fish, Fangs or Fancy Feast but since I participate in the 52 Snapshots of Life Photo Challenge hosted by The Lazy Pit Bull, it will stand for Foolish cos that’s this week’s theme. I’m participating in both #52 Snapshots, a weekly photo challenge and the Blogging From A to Z Challenge! I’m up for the challenges! TW tries to embarrass me or make me look foolish on occasion but then I won’t give her the go-ahead to publish those pics. She puts all these dumb things on my head. But you know when I feel really foolish? When I’m forced to pose with stuff that comes in the mail and especially when I have to pose with some of her dumb records or books. I don’t even get extra pay treats for this! Yeah. Yeah. TW’s in these books. Big whoop. Sometimes I have to pose with dumb stuff and TW takes a hunnert pics and then decides not the use them in a blog. Like this one where she thought it cute to make it look like my head was inside this bong. You know what? TW should be the one who feels foolish about putting The Cat through so much. Do your humans deliberately try to embarrass you by making you look foolish? For the duration of this Challenge, this former shelter kitteh will be spotlighting adoptable cats from A to Z. If you have any fosters, rescues or cats that need to be rehomed and you want them featured here, drop me an email or message the Stunning Keisha page on FB. I gotta say I’m not being overwhelmed by requests. You’d think people would want their foster kitties publicized. F is for Flo and Flo is no foolish cat. 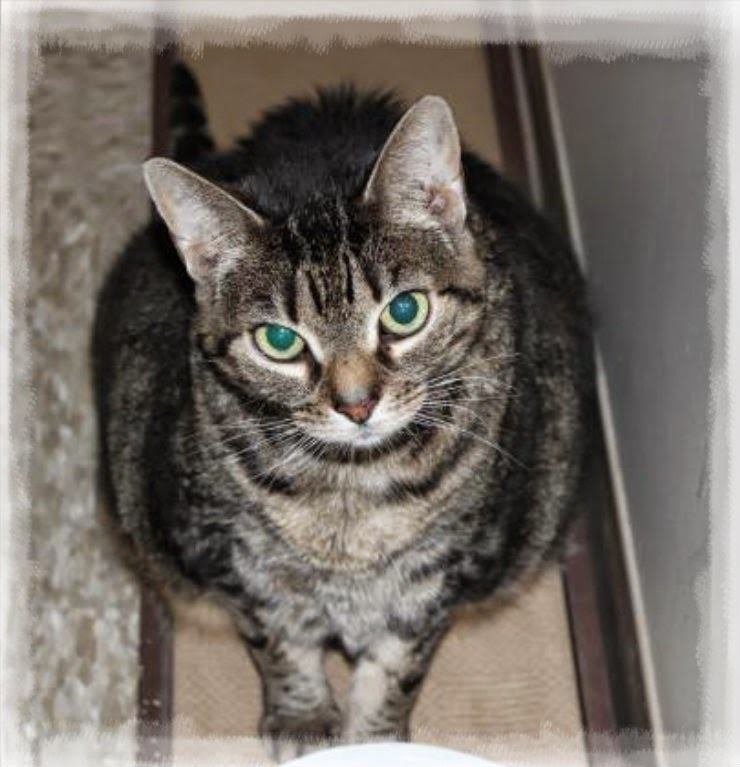 This 11 year young ladycat is spayed, vaccinated and has tested negative for FIV and FeLV. She knows what she likes and ain’t afraid to tell you. Take it away, Flo! "Hello my name is Flo, sometimes I enjoy being called Miss Flo. I am a happy kitty. My favorite thing to do is rub against people's legs. I will weave in and out of their legs as they walk. Then when they finally stop walking I am quite content to sit in front of them and squint my eyes at them. I also enjoy spending time on my back with my feet in the air. And I like to open cabinets so I can go inside and take a nap. I also love cardboard boxes and I like to chew on any hanging tape on the boxes. Everyone tells me not to do that but I think it is quite tasty." Here’s what the humans at Happy Feet in Secaucus, NJ, say about me: "Flo is a quiet and reserved kitty. She loves to have her head scratched and she likes to be brushed. Flo also enjoys kneading and sleeping in her kitty bed or on a fluffy blanket. And she loves catnip. All she needs is a human companion to keep her company and give her all the love and attention she needs to get her over her past experiences. Flo would do better in a house without dogs, other cats and small children." If you’re innerested in Flo or any other cats at Happy Feet, email happyfeetadoptions@gmail.com to make an appointment to visit them. You can view their adoptable cats on Petfinder. Ugh, I hate when my momma gets "creative" too. Did you know there's a website called stuffonmycat.com? Don't tell TW about it though--it might give her ideas. Flo's a sweetie! I will be honest... I kind of like it when my human does something to make Binga look foolish! Keisha, what in the world is that on your head?? and how did you get you head in that jar and your tongue is cute and... you should pounce on TW... mol. -Lulu who likes being silly. Purring for Flo to find her furever home furry soon... what a smart and sweet girl she is... -Katie Kat the Mom. 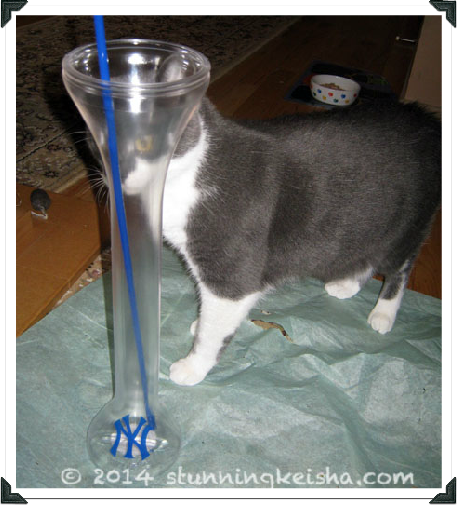 LOL now laughing at the thought of stufffonmycat re Spitty's comment.Off to check it out. Have a terrific Tuesday. Creative humans can equal a dangerous thing! hahaha! Well, those were cute photos CK! Such a beautiful Ladycat. I hope someone steps up and goes with the Flo! Flo is such a pretty kitty. I hope someone will take her home soon! CK I feel your pain about having to pose with stuff. Mom makes me do it all the time too! We sure hope Miss Flo finds her forever home very soon, what a beauty she is. 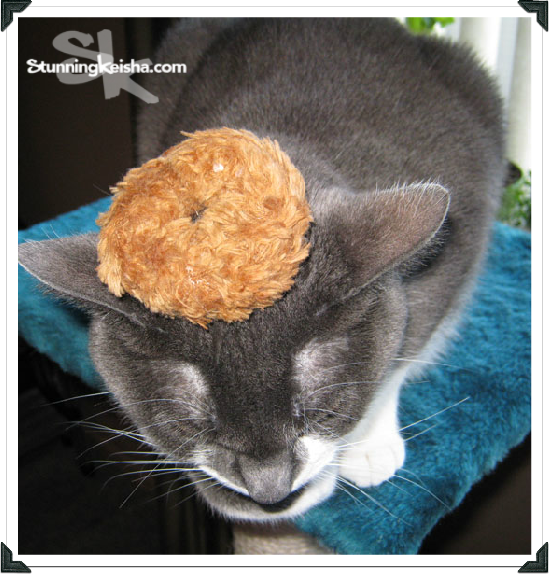 CK who put that furry doughnut on your head?! Aaaaw CK we fink you stil look bootyful. And like you we fawt dat wescues wuld luv to work wiff a bloggy and get their bootyful kitties even mowe publicity, but weez been askin' to work wiff a wescue or shelter fur a year now and haven't had any success. We finally fawt we had ne and then she never wuld send us fotos or tell us anyfin' 'but da kitties. It's cwazy isn't it? They post Need help but when you offer, they never wespond. Well yous duin' a good fing and good luck. We see that Spitty already mentioned Stuffonmycat. Yeah, don't encourage TW to check it out, or it gets worse. MOL!!! Those are all great shots! 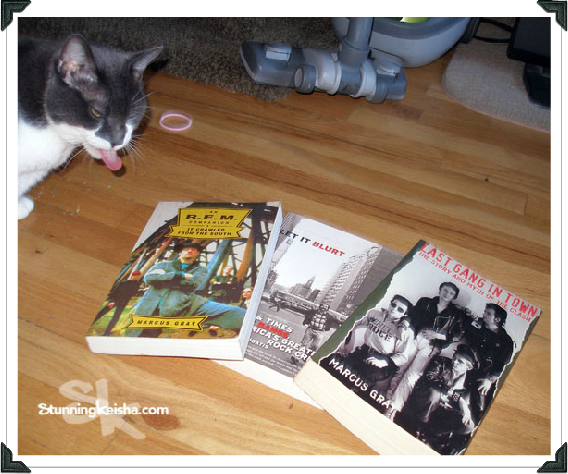 Are you sticking your tongue out at the books in the second one? MOL, cute shots. Especially the thing on your head shot. My mum puts silly things on my head too, usually the sticker from melons. Did your mom write those books? Curious to know? :) Can't stay as the AT wants to go and check that site that Spitty mentioned!! BTW we went back to the post where you put pics of TW and Pops and we even commented back in 2013. Can't believe I've known you that long!! Us humans are always taking photos that make kitties (and other humans) look foolish. Somehow you stay totally cool and stylish throughout all of TW's stunts, CK. You're always beautiful. Flo is a super cute kitty too! Hello darling--It was very cozy having you on your blue pillow, you know. And you brought that nice rain with you, too! CK, we can't believe you let TW get away with that stuff. We're purring that Flo finds a home real soon. Luckily, our humans pretty much use Photoshop to try to make us look silly. Purring and praying that Flo finds a forever home soon. Thank you for featuring all these kitties who need homes! Flo is such a pretty cat! Sharing and hoping she'll find a purrfect forever home soon. No one makes me look silly without photo editing, na'mean? And Flo is a lovely tabby ladycat. 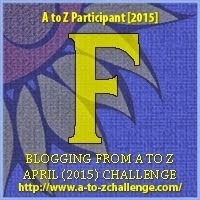 Sharing for the girl and loving this A-Z thing. I'll be honest and say that a cat as lovely as you cannot really look foolish but that tongue photo made me laugh so thank you. And I love your A to Z theme of featuring cats in need. I hope they each get homes as quickly as you reach Z!! !